DID rims 2.50" and wider are deep drop center and require shorter spokes. 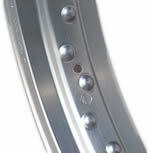 with this polished finish, please select the rim from above and add this polishing to your order. DID Rims come standard with a brushed machine finish and a clear anodize coating.